Something rather surprising and unexpected happened to me in early November. I was removing the black shelving from the back of my desk, and wondering how to paint the laminate white, in accordance with my new décor goals. And I suddenly looked at all the STUFF that I'd removed from those shelves — and was hit by the realisation that I didn't need all that stuff on my desk. I didn't want it there. I practically never used it. ... A few hours later, I stumbled from my room. I saw everything in a new light. Minimalism was a thing I'd never heard of — frugal living, green living, all these, yes — they have similar methods, goals and outcomes, and I've worked at them in the past, but the philosophy of minimalism struck to my heart. I downloaded Miss Minimialist's (Frances Jay's) book The Joy of Less, A Minimalist Living Guide: How to Declutter, Organize and Simplify Your Life to my iPad (it seemed a little weird to order a physical book about the minimalist life!). I kept reading. From Miss Minimalist I ventured to other blogs. 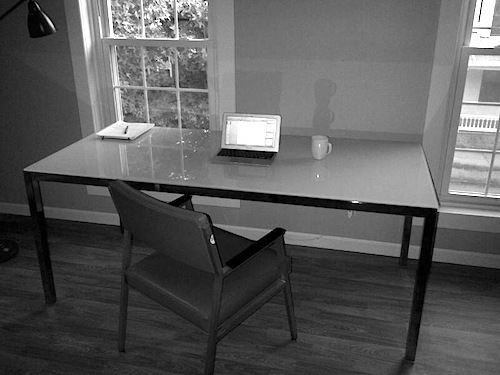 The Minimalists is another one I like. Several things in Frances' book really made sense to me personally. A big one for me was the relentless drive for perfection ... you buy another set of measuring cups because the ones you have aren't quite perfect enough. Once everything in your home is perfect, then will life be perfect? I know that this drive to 'find the best X' really was a problem for me. Kitchenware was especially a problem, my big weakness (not shoes or handbags, but garlic presses and cookie cutters). I would get the 'wanties', and with online buying being so easy nowadays, we had a weekly parade of delivery vans at our door ... (mind you, a lot of them are for Glass Son's glass supply deliveries). I also found Frances' methods very effective ... tip everything out of a drawer, shelf, or cupboard, and assume it's all going. Only put back in the things you choose to keep! This is such a different mind-set from the 'throw out the stuff you don't want' tactic. I've unsubscribed from shop / sale site email lists. I've cancelled catalogue mail outs. I even deleted my lengthy 'lent to' list, where I was keeping track of who had which books or things I'd lent out ... let them keep them. I reckon I've given away about half of our belongings now, but I'm not done yet ... 75% is my goal. I have a bit of a reputation in Freecycle Canberra. Most of my books went to Lifelife for their famous annual book fair. I donated yarn to a local nursing home. Friends have taken things off my hands. Doggy toys have been passed on to animal shelters (how many chewy toys do two chihuahuas need, after all?!). I sold some stuff (books, yarn, and designer label clothes) on eBay. There's been a few trips to the local tip. Each time something leaves, a little more weight lifts. The upheaval and mess surrounding this process has been massive ... it looks like we're moving house. But I think the place is starting to look better now. 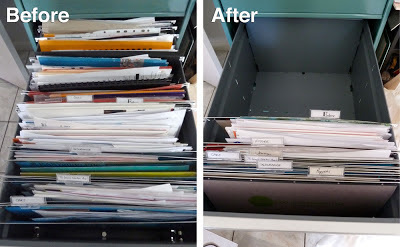 My filing cabinet. I went from 4 drawers jam packed to only one. Papers with personal information on them were shredded before being recycled. And the laundry ... I gave away several boxes of things we never used (duplicates of cleaners, floor wax, nappy soak, and so on). Because I'm not just tidying up, but getting rid of nearly everything, and only keeping what we actually use and need, the rooms aren't getting messy any more. You would not believe how much easier it is to keep the kitchen clean now, with half the amount of crockery, cutlery, cooking pots, bowls, and so on. How many knives or mixing bowls can you use at once, anyway? Miss Minimalist's Short Guide to Consumer Disobedience really struck a chord for me, too. What is completely staggering to me is how I can now go to a shopping mall, walk around, and feel completely unaffected by the advertising and sales and all the stuff in all the shops — yes, even the kitchenware shops — I test myself by going into them. I can step into a bookshop and come out with nothing. No more wanties. In the past six weeks I have bought about three things that weren't food, bills, postage, petrol, or medicine. A few pieces of Japanese fabric from a shop I wasn't likely to visit again, some net curtains to replace torn ones, and four teaspoons. When I've cut back on spending before it because we had to, and were poor, or trying to be frugal. I could do it, but felt deprived. I was being strong, but fighting my desire to buy things. Now, with a minimalist view on life, I don't actually want things any more. I don't feel deprived at all. 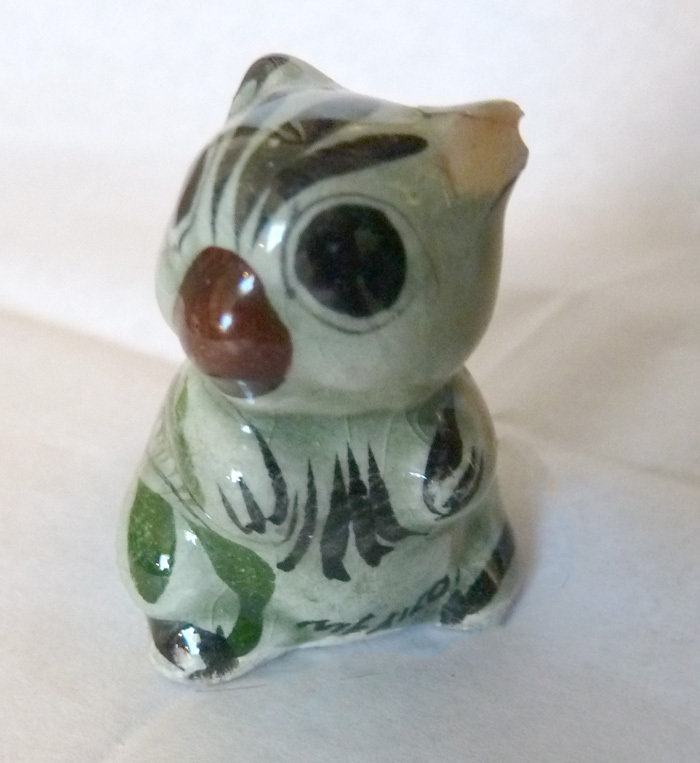 I have been challenging myself every step of the way, and doing things like finding homes for sentimental items, like a little ceramic chipmunk from Mexico, from when I lived in Arizona as a child. I can remember living there, and I don't need to keep a knick knack to remind myself. I took a photo of it, and then let it go. I met another minimalist, with years' experience under his belt to my weeks', on Freecycle; he and his family only replace things when they get broken. And no, he wasn't some long-haired hippy, he was a softly-spoken distinguished British gentleman. The family has been supportive too. Hubby has halved his wardrobe, and is thrilled that I'm doing all this (especially as I'm doing it, and he doesn't have to!). Dotter has started to work on her room. Don't think Glass Son has done much, but there's only so much you can hope for, hey? 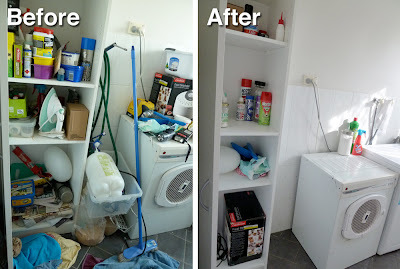 This is very much an ongoing process ... rooms need to be revisited, I'm getting better at culling and making the hard decisions as time goes on, and there's the daily battle against new stuff coming into the house. I want to digitise our whole photo collection, and remove the originals from the house. But with each success over each area, whether a drawer or a room or an attitude, I can feel our life becoming simpler and easier. This is more than just 'decluttering', it's a philosophy of life. Lighter living on this planet. Less consumerism. Less clutter. Less housework. More time for the important stuff, like family, friends, and enjoyment of life. Very nicely written article Denise! I'm encouraged to see you've made so much progress so quickly… while I still flirt with the idea really. I'm still a little disappointed to hear that your Freecycle friends aren't long-haired hippies though—there just aren't enough long-haired hippies around these days, and I don't have enough hair to pull it off anymore. And good to see you here. Denise, I loved your post! Oh how I wish I could do this... declutter. It's not a problem to not purchase, but it is still a problem to let go. Good on you and congratulations for being so strong. Wishing you and your family a wonderful Christmas and New Year. You so totally rock! I'm not ready yet, but I can stand back and applaud. I have been slowly getting rid of unneeded things over the past year (and it's amazing how everyone's definition of NEED is so different). I am making slow progress but that's good because it's less clutter but no one really misses it. I don't know about getting rid of the photo albums. I like digital photos but I also like to touch the originals. Good for you! When we moved from California to Nevada over a year ago we had one moving truck to fit everything into. If it didn't fit, it didn't go. We filled a small dumpster of "stuff". We have a new house and I didn't think I'd like a minimalist look but, I really do! Looking forward to reading the blogs you've posted. I am currently getting to this point and have been looking for the inspriation to declutter.. Thanks for the links to those minimalist site... this may be the beginning of the end of clutter for me! Just wanted to share some examples of what my students do with other folks “clutter”. They create art. Even the smallest ball of yarn can be turned into art by my young students. I am sharing what they have created.